I got up at my regular time this morning, but realized I was exhausted and went back to bed for an extra 30 minutes. We'd been on holidays since the 7th and made the long journey back yesterday. I think it took more out of me than I realized. When I go on vacation, I have this ability to truly shut off. Outside of the time I spent online - time that was more recreational than anything else - I lived in the moment, and absorbed all the flavours of the places we saw, the people we met, and the experiences we had. And while some work and volunteer business penetrated, it was only for brief moments. As soon as we stepped out of the hotel and into the cab to go to the airport, I began the re-entry process. The list started forming in my mind of the things to get done, issues that need to be dealt with, and the dynamic menu of projects and responsibilities. Today is my re-orientation day, a day to get my feet solidly on the ground and ready for the exciting weeks ahead. I know Dylan and Ben are going through a similar process. They each have things that are on their minds, projects they want to do, auditions, school work, exams and various other things that occupy 11 and 15 year old minds. While it's important to truly check out and go on holidays, it's equally important not to let the growing list of things overwhelm you when you get home. (Can you tell I'm giving myself some self-therapy?) 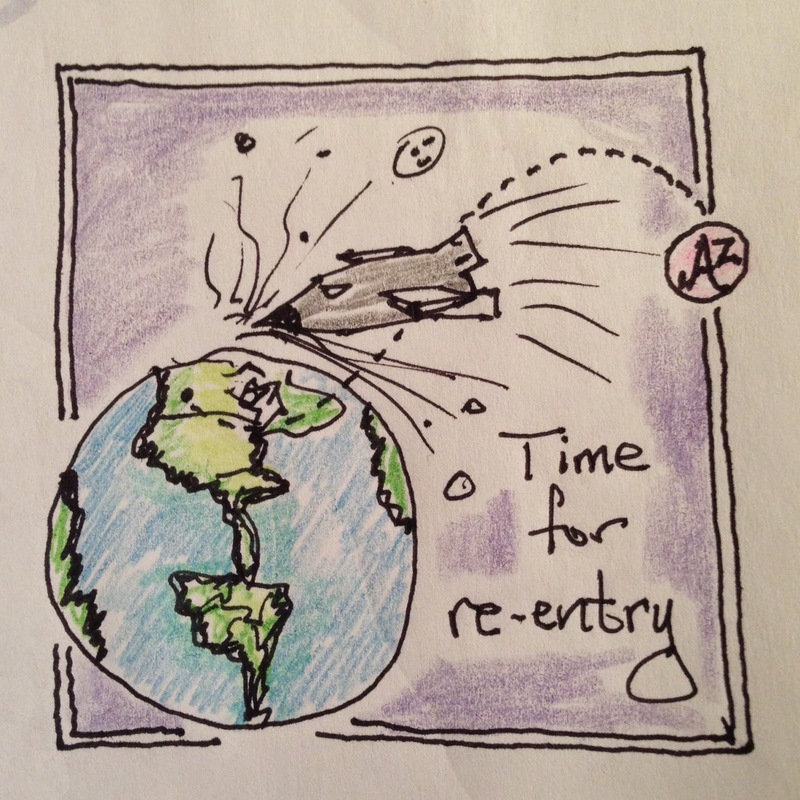 Re-orientation day is just the beginning of the re-entry process, and it is going to take a couple of days to feel normal again. I made a major decision to give up a substantial volunteer gig over the holiday. I didn't leave town with the intention of doing that, quite the opposite really. It was something that was weighing on me, and an ill-timed email that I received as we were leaving the country helped make the decision for me. In that moment, I realized that the best thing I could do to help that particular project was to let it go. I've never been good at letting go, but it was the right thing to do. Part of my re-entry process is coming to terms with that new reality and forgiving myself for not being able to follow through with that project. My hope is to still contribute, just in a different way. This is going to sound bizarre, but the one thing I did think about throughout our holiday with respect to regular life, was going back on the Ideal Protein program when we got back. The anticipation of going back on the program was palpable as I devoured yet another calorie-infused southwestern cuisine meal. I'm looking forward to eliminating choice from my food and beverage intake process for a month or two. That may sound awful to you, but I actually look forward to it. I will make a special trip to the other Ideal Protein location, as my regular one is closed on Fridays, so I can get started immediately. Cleaning, shopping, organizing, culling, contemplating - it's reorientation day in Russell's world.